It was reported prior to UFC 119 that Jon Jones’ next potential victim would be the winner of UFC 119’s co-main event between Ryan Bader and Antonio Rogerio Nogueira. While the thought of eating one of Jones’ elbows is enough to send former light heavyweight title holders heading for the hills, Bader claims he’s down to fight whoever it takes to justify a shot at the crown. “I feel like I’m close. 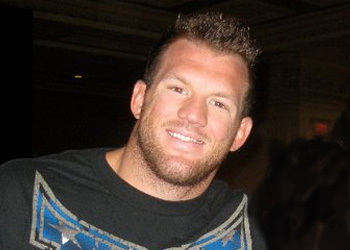 It’s my goal, but I’m willing to take my time,” Bader said of his championship aspirations. “I’m pretty young in this sport and I have a lot to learn. I want to get in the gym and correct mistakes and learn a lot more, but my ultimate goal is to have the belt one day. The Arizona native took a significant step towards accomplishing that feat by handing the veteran a lopsided unanimous decision loss on Saturday. Bader is now perfect through his first 14 professional scraps and is staring a bout against the planet’s nastiest 23-year-old dead in the eyes. “We’ll see. It’s whatever the UFC [decides] – where they wanna put me, who they wanna put me against,” Bader matter-of-factly stated. “Getting up to this level, Nogueira included, these guys you can switch ‘em out. You can put whoever in there. They’re all the same, they’re going to be tough as nails no matter who you face. While most believe there isn’t much separation in talent between the Octagon’s light heavyweight elite, not many would agree that fighting Jones would be “the same” as facing a Rashad Evans or Quinton “Rampage” Jackson, for example. In fact, there are only a few mixed martial artists “Bones” wouldn’t be favored against at this stage in his skyrocketing career. Regardless, The Next Coming is already organizing his notes in preparation for his impending exam. “Let’s go baby! I feel more alive.. so happy to have homework,” Jones tweeted.